Brave and Happy: Who has the answers? Who has the questions? Who has the answers? Who has the questions? In a typical classroom in the not so distant past, teachers asked all the questions and looked for good answers from the students. As much as we tried to call on every student equally and fairly, the best answers were almost always provided by the students that felt school was easy. Whether the question was a simple question with one answer, or the question was open-ended and thought-provoking, good answers usually came from the highest-achieving students. In a classroom that values questions, good ones can be provided by any student! A question isn't right or wrong. A question asks everyone to think. Asking students to ask questions doesn't require kids to search their data banks for a singular answer and it doesn't require them to formulate a response to an open-ended question. 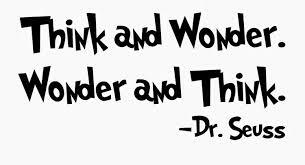 It simply requires curiosity and wonder! When we ask kids for questions instead of answers, we level the playing field for participation by all students and we raise the level of thinking required!